Since opening in April of 2007 Selma’s Chicago Pizzeria on Avenida Del Mar has been a busy place. The décor successfully couples homey and modern - brick walls, mahogany wainscoting, a fireplace, dark ceiling, contemporary fabrics, and art for sale on the walls - and gives patrons who enter the feeling they have come to a home away from home. 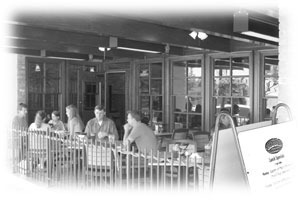 High-backed booths allow for privacy. Classic rock music plays in the background. And an outdoor patio is refreshing when the weather is mild (heated when it isn’t), offering a wonderful vantage point for watching the meanderings on Del Mar. It’s a family-oriented, gathered-for-conversation- and- eating kind of place, where big screen TVs broadcast the requisite sports, featuring the NFL Sunday Ticket that draws a large sports crowd. The story of this eatery is printed on its menu stating that Grandma Selma was a matriarch who had a passion for good food. She fed the family, always cooking from scratch using fresh ingredients. It was this passion that inspired co-founders Mike Phillips, Jr. (Selma’s grandson), and his friend, Eric Miller, to carry on Selma’s tradition here in San Clemente. Selma’s menu is broad. It took this writer several minutes to read through all the offerings, and even then no ordering decision could be made. Too many items sounded delicious, and neither my teenager, who accompanied me, nor I, had any idea what we were in the mood for. Don’t you hate when that happens? Not to fear. The wait staff made nice recommendations, and in the end we decided to sample the most popular items. And of course, pizza was at the top of the list. Before the pizza arrived we worked our way through a variety of “appe-teasers,” which included “born to be wild” wings (ordered hot on the heat scale), bruschetta favorito, toasted ravioli, and “not another fried cheese” cheese. The wings were tender and spicy without the taste bud burn-off so often associated with chicken wings. The flavor was actually realized and we didn’t need to dunk them in the accompanying ranch dressing to cool the fire. The toasted ravioli were filled with a blend of cheeses and spices. These were surprisingly smooth and creamy on the inside and crunchy on the outside. Very tasty. Even as cold leftovers in the morning. Who doesn’t like fried cheese? Need I say more? But the biggest shock was my teenager’s reaction to the bruschetta favorito. Chunky tomatoes, basil, garlic, onions, olive oil, and parmesan cheese on toasted bread? My tomato phobic son said it was his favorite; evidenced by his continual scooping. Then along came chicken and spinach ravioli topped with cream sauce. Another hit. Next up on the tasting tour was Buck’s BBQ chicken chopped salad. Mixed greens, tomatoes, black beans, corn, green onions, cilantro, provolone cheese, tortilla strips and grilled chicken. This salad is a favorite at the restaurant, as well it should be. Finally, we sampled the most popular item on the entire Selma’s menu … the “pedal to the metal special” a.k.a. “The works.” It is a deep dish pizza with meatballs, pepperoni, Italian sausage, black olives, mushrooms, and green peppers, topped with fresh Roma tomatoes. If you love thick crust and toppings this one’s for you. My eyes grew wide when the first piece was carved, cheese strings trailing, and placed on my teenager’s plate. I was skeptical as he approached it like a surgeon and dissected the bits and parts, not to scrape any off, just for identifying purposes only. The only word out of his mouth after his first bite-before the second and third bites-was “stellar.” From him, that’s a grand slam. For my part, I was pleased to find the crust wasn’t doughy. It was almost fluffy. All-in-all a great experience. The only menu item we didn’t have a chance to savor was “the mother ship:” a triple chocolate fudge brownie, hot out of the oven, with vanilla ice cream. Perhaps we’ll try it on a return trip! 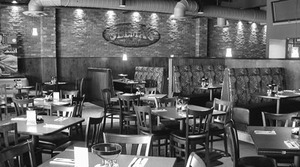 Visit Selma’s on Ave. Del Mar or call 276-2828.